Alcatel has just announced that its Idol 4 smartphone and Pop 7 LTE tablet will be available for purchase in Canada beginning this week. The announcement doesn't come as a surprise since we reported last week the Idol 4 will come to Canada with free VR goggles in tow. Today, the company confirmed the Idol 4 will be available in Canada on September 30 for as low as $0 on a 2-year plan or for $299.99 with a no term contract. The Pop 7 LTE tablet should go on sale on the same day for $149.99 or $6.25 a month with $0 upfront. Both Alcatel Android devices will be available in Canada through Bell and Virgin Mobile carriers. The Idol 4 and Pop 7 LTE will ship with Android 6.0.1 Marshmallow operating system right out of the box. The smartphone sports a decent 5.2-inch display that supports full HD (1080p) resolution, while the tablet has a 7-inch (1024x600) display. It's also worth mentioning Alcatel Idol 4 is powered by an octa-core Qualcomm Snapdragon 617 processor clocked at 1.5GHz, whereas the Pop 7 LTE tablet is slightly less powerful since it packs a 1.1GHz quad-core Qualcomm Snapdragon CPU. For photographers, Alcatel added a 13-megapixel main camera on the back, as well as a secondary 8-megapixel wide-angle front-facing camera for selfies. Memory-wise, the Idol 4 is on the average side with its 2GB of RAM and 16GB of storage (expandable up to 128GB via microSD card). Another aspect highlighted by Alcatel is the dual 3.6-watt speakers that include Waves Audio technology, which should provide Idol 4 users with an immersive audio experience. 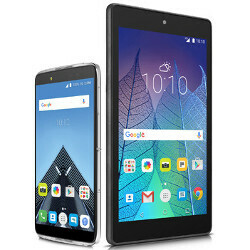 On the other hand, Alcatel's 7-inch tablet packs only 1GB of RAM and 8GB of storage (microSD card support up to 32GB), hence the much lower price. There's also a 5-megapixel camera on the back and another 2-megapixel snapper in the front. However, the Pop 7 LTE tablet is powered by a larger 3,240 mAh battery, whereas the Idol 4 features a 2,610 mAh battery inside. The Dtek 50 costs $450 outright and is pretty much the same device but with 1 extra GB of RAM, and BB software. The Idol 4 seems like a much better deal, and actually competes really well with the Moto G Plus, for a good chunk of change less (Moto G Plus goes for about $410). Difference will be 1gb of ram, monthly security updates and dtek security. For me those are worth paying extra.